The imaginary band of the celestial sphere on either side of the yearly path of the sun, moon, and stars, divided since Babylonian times into 12 segments named after the 12 constellations, each with its own symbol. The zodiacal calendar, this one adorns the Bracken House in London. Reproduced by permission of Fortean Picture Library. 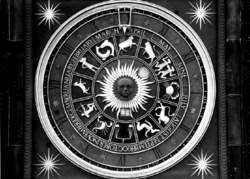 The zodiac (literally, “circle of animals,” or, in its more primary meaning, the “circle of life” or “circle of living beings”) is the “belt” constituted by the 12 signs—Aries, Taurus, Gemini, Cancer, Leo, Virgo, Libra, Scorpio, Sagittarius, Capricorn, Aquarius, and Pisces. This belt is said to extend 8° or 9° on either side of the ecliptic (the imaginary line drawn against the backdrop of the stars by the orbit of Earth). The orbits of the various planets in the solar system all lie within approximately the same geometric plane, so from a position within the system, all the heavenly bodies appear to move across the face of the same set of constellations. Several thousand years ago, the names of these constellations became the basis for the zodiac. A distinction must be drawn between the sidereal zodiac and the tropical zodiac. The sidereal zodiac is located more or less where the constellations are positioned. The other zodiac originated with Ptolemy, the great astrologer-astronomer of antiquity, who was very careful to assert that the zodiac should begin (i.e., 0° Aries should be placed) at the point where the Sun is positioned during the spring equinox. Because of the phenomenon known as the precession of equinoxes, this point very gradually moves backward every year, and currently 0° Aries is located near the beginning of the constellation Pisces. Astrologers who adhere to the Ptolemaic directive—the great majority of modern, Western astrologers—use the tropical zodiac (also called the moving zodiac, for obvious reasons). If the tropical zodiac is used, it should always be carefully distinguished from the circle of constellations (i.e., from the sidereal zodiac). The notion of the zodiac is ancient, with roots in the early cultures of Mesopotamia; the first 12-sign zodiacs were named after the gods of these cultures. The Greeks adopted astrology from the Babylonians; the Romans, in turn, adopted astrology from the Greeks. These peoples renamed the signs of the Babylonian zodiac in terms of their own mythologies, which is why the familiar zodiac of the contemporary West bears names out of Mediterranean mythology. The notion of a 12-fold division derives from the lunar cycle (the orbital cycle of the Moon around Earth), which the Moon completes 12 times per year. From a broad historical perspective, zodiacal symbolism can be found everywhere, and zodiacal expressions are still in use in modern English—e.g., bullheaded (an allusion to Taurus), crabby (an allusion to Cancer), etc. Throughout the centuries people have drawn parallels between the zodiac and many other 12-fold divisions—such as the Twelve Labors of Hercules, the Twelve Disciples, and the Twelve Tribes of Israel. The popularity of sun-sign astrology (the kind found in the daily newspaper) has kept these ancient symbols alive in modern society, and even such prominent artifacts as automobiles have been named after some of the signs (e.g., the Taurus and the Scorpio). Cirlot, Juan Eduardo. A Dictionary of Symbols. London: Routledge & Kegan Paul, 1971. Tester, Jim. A History of Western Astrology. New York: Ballantine, 1987. (Greek zodiakos, from zoon —animal), the 12 constellations (Aries, Taurus, Gemini, Cancer, Leo, Virgo, Libra, Scorpio, Sagittarius, Capricorn, Aquarius, and Pisces) situated along the sun’s apparent yearly path among the stars (the ecliptic). The name “zodiac” is connected with the fact that the most of the zodiacal constellations even in ancient times bore the names of animals. The apparent path of the planets of the solar system and the moon also passes through the zodiacal constellations. In ancient Greece the constellations of the zodiac had al-ready been distinguished into a special group, and each of them was given its own astronomical symbol. The points of the vernal equinox (constellation Aries), the autumnal equinox (Libra), the summer solstice (Cancer), and the winter solstice (Capricorn) were designated by the symbols of the corresponding constellations. Because of precession, these points have shifted during the past 2,000 years from the constellations mentioned above; however, the designations that were given to them by the ancient Greeks have been preserved. Also retained are the names tropic of Cancer (northern tropic) and tropic of Capricorn (southern tropic), which corresponded to the summer and winter solstices in that period. The constellations Scorpio and Sagittarius are visible in the southern regions of the USSR; the rest are visible throughout its territory. What does it mean when you dream about the zodiac? This spherical symbol of the astrological signs that bear the names of the constellations could be an indication that one’s subconscious is guiding one to investigate astrology, or to have a chart cast by an astrologer—especially if this dream occurs around one’s birthday. Alternatively, it could also represent a sense of feeling fated or even fatalistic. A band of the sky extending 8° on each side of the ecliptic, within which the moon and principal planets remain. Given its standing not only as one of the 12 zodiac symbols of the East Asian calendar, but also as one of the four direction or miracle animals, the dragon has a substantial influence on everyday occurrences in East Asian life. Don't worry: Zodiac landings from cruise ships such as Marco Polo are choreographed to the -nth degree. Waddling down the hall to the Marco Polo's Zodiac staging area, we looked very much like fat little red penguins wandering from the nests for our daily outing. As our Zodiac pulled onto the beach, one particularly inquisitive fellow waddled to within 15 feet of us. To further enable users to organize and display photos on their Zodiac consoles, Missing Sync for Tapwave includes SplashData's acclaimed SplashPhoto image viewer. Mac users who love great multi-media action and having music, games, news, photos and the information they need to access at a moment's notice at their fingertips anytime/anywhere, will need look no further than Zodiac and The Missing Sync for Tapwave. Zodiac users will now be able to significantly increase their handheld's functionality as a source for information and entertainment, including the ability to tie into their Mac's Internet connection to download emails and browse Web pages. the Zodiac as a card reader or for portable storage. The Tapwave Zodiac 1 and Zodiac 2 are supported and require the Zodiac 1. Though politics may be divisive, Zodiac Vodka remains an independent taste; a true neutral spirit enjoyed by the left and right alike. With its clean, naturally smooth taste, ZODIAC has revolutionized the vodka community both in name and quality. For more information on Zodiac Vodka please visit www.